How to correctly mount double-lock grips? I have a pair of PRO double lock-on grips (id est two lock rings per grip). In a recent crash, following an immensely helpful tip from a fellow rider, I clung to one end of the handlebars, turning the other end towards the ground. The handlebar absorbed much of the impact and only a month later I was able to ride my bike again without any pain. My question is: have I mounted the grips correctly? As is visible, the white plastic part protrudes from the handlebar. And that is exactly where the metal lockring sits. Should the white part be pushed further inboard? It seems to have smaller inside diameter than the rest of the grip and was not sliding in easy - that's why I mounted it as I did. Almost certainly the entire grip should be on the handlebar. Then the 2 pieces of steel pushed in by the screws will tighten against the handlebar giving much better security. The steel pieces should go in the cutouts on the hard plastic inner of the grip. I'm not sure how well the grips will work now that they are missing some of their structure, but it's worth a try. FYI, the reason that the hard part is more difficult to get on is that the multi part grips can get away with a looser tolerance under the rest of the grip, but not where they are actually attached to the handlebar. Grips are cheap - buy some new ones. If you really want to save these, turn them over so what was inboard is now on the outside. Or swap left for right. The clamp should be onto the solid metal of your bars, not floating loose in the air. In addition there should be bar plugs into the end - these are glorified rubber or plastic corks which help prevent O-shaped holes in other people, in the event of an accident. Often events require you to have bar plugs fitted. Not the answer you're looking for? Browse other questions tagged mountain-bike handlebars new-bicycle-assembly or ask your own question. What types of mountain bike handle bar grips are available and how to they affect comfort and handling? How is this kind of cycling correctly called? How to separate ODI grips from lock on clips? Can lock on grips go with carbon fiber handle bars? Replacing the handlebar grips with ergonomic ones? Bullhorn handlebars or extension grips? 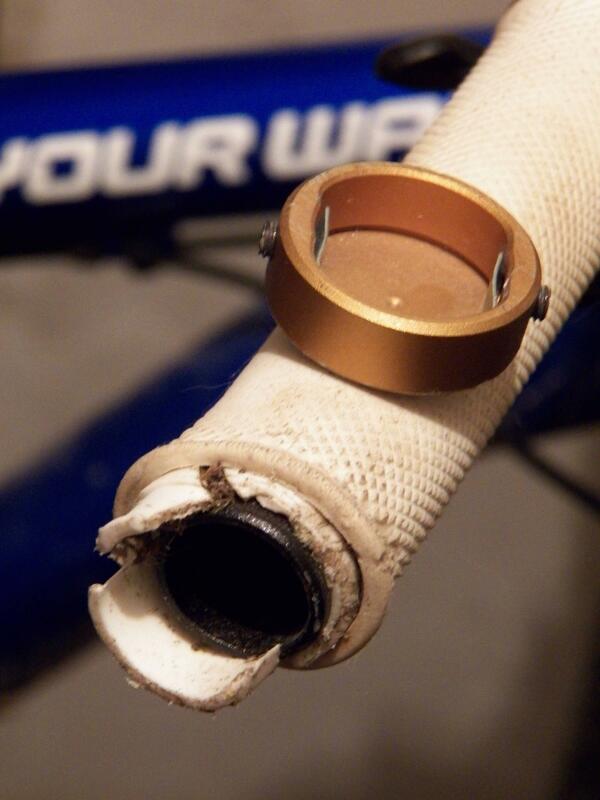 How can I prevent rubber handlebar grips from melting/disintegrating?